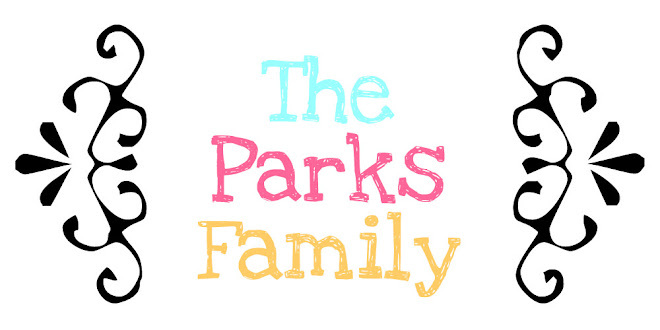 The Parks Family: Ten Things Tuesday! Here's my list for today! 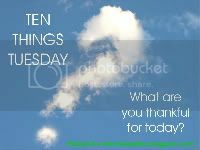 Visit my friend XBOX Wife to get the details on how to participate in Ten Things Tuesday! I got to sleep in this morning! My girls slept late & my sweet hubby let me sleep in while he got ready for work. Payton & Presley have been pretty nice to each other today... only a couple of girl fights!!! I did more cardio than usual at the gym today. All of the laundry is done!!! We had our biggest group yet at our house Sunday night for Small Groups Church! My backyard is looking nice. Brandon trimmed our red tips along the fence & I raked and bagged a bazillion bags of leaves! Brandon has had a busy last couple of weeks at work, but comes home each day with a big smile on his face & is ready to see "his girls"! I cleaned out the inside of my car today!!! I peeked in on the girls this afternoon to find Payton reading a book to Presley... love it! My life! 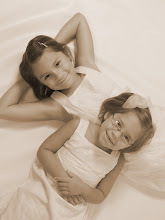 I have an awesome husband & 2 wonderful daughters that I get to stay home with... life is wonderful! I love your second and ninth joys this week! Sounds familiar! Hi, Jill!! I really enjoyed your list again this week. I am really looking forward to sleeping in on Thursday, since tomorrow is our last day of school. Have a blessed week! Awww, so cute that your big girl was reading to your little girl. I love that! Ha! Me cleaning out my car would make my husband's top 10 list for sure! Are you on blogging vacation girl??? Hey Nikki~ I am taking a little break from blogging... Things are crazy busy around here!!! Where in the Sam Hill have you been girl.....9 days and counting of no posts??? I hope you are on a luxury cruise in Fiji. Hope to hear from you soon!